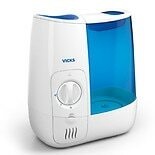 When dry air in the home causes irritation to the delicate tissues of the nose and throat or exacerbates dry skin, Vicks Humidifiers can help bring the moisture back to the air you breathe. 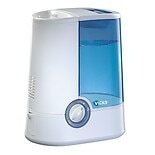 During the cold winter months, when humidity levels plummet to uncomfortably low levels, or in arid parts of the country when almost every day is a dry day, these humidifiers help to regulate the level of moisture to temporarily lessen the symptoms of respiratory discomfort. They are carefully designed to provide a safe, measured and filtered source of moisture, for entire rooms or for individuals. Just as humans feel most comfortable within a certain range of temperatures, we also best enjoy air that offers a certain level of humidity. Too little moisture in the air and skin can become dry and more prone to flaking and even cracking; the delicate membranes of the nose, mouth and lungs can also become irritated. 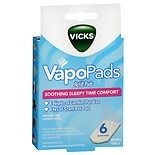 Coughs, colds and congestion can become even more uncomfortable under these conditions. 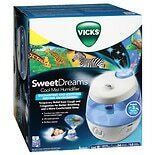 Models of Vicks humidifiers provide cool mist, which helps you to breathe better and sleep more comfortably, and warm mist, which helps to relieve cough and congestion symptoms. Many automatically adjust the amount of humidity to maintain a consistent level, while some have an adjustable outlet to control the direction of the mist "plume." In addition, many models include filters to remove irritating dust, pollen and odors from the air. 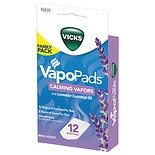 Vicks began by offering a salve -- now famous as Vicks VapoRub -- to help relieve the symptoms of scratchy throats, coughs and congestion, they have continued to help people feel more comfortable. 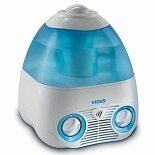 When electric humidifiers became available, Vicks partnered with the manufacturing company Kaz to produce safe, effective humidifiers for home use. 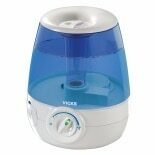 Kaz remains an innovative global leader in state-of-the-art healthcare and home comfort equipment. 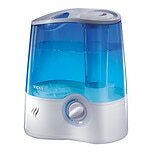 Their designs provide safe, effective humidifiers to provide a steady, filtered and adjustable level of moisture to air in the home, helping to temporarily relieve symptoms caused by low humidity.